It’s been a genuine pleasure to interact with the many thoughtful Maple Leaf supporters who have frequented this forum over the past few years. In fact, this post marks the “5th anniversary”, if you will, of the VLM site. As I approach almost 1,500 stories/posts here, I recall that my initial inclination, back at the end of September, 2009, was that Vintage Leaf Memories would be exclusively a site where I would indeed share memories about the “old days”. For me, that brings me back to when I was a child in the late 1950s and early 1960s. I really enjoy harkening back to the good old days. 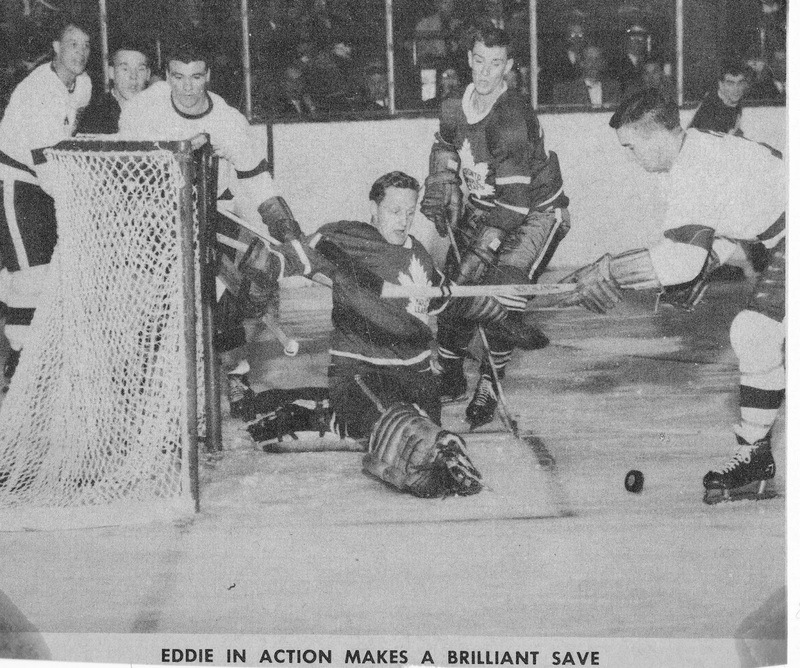 Whether it relates to memories of Eddie Chadwick (in late 1950s action against Gordie Howe and the Red Wings, lower right), Johnny Bower, Don Simmons or Bruce Gamble, all Leaf neminders of my childhood, or any number of other Leaf greats, talking about hockey from those golden days brings back warm memories. But fairly early on I recognized that there might also be a way to chat about current Leaf topics in a way that is perhaps a bit different from some other sites. I’m not a humourist. I don’t follow the "advanced stats” world closely. I'm not an "insider". I’m just a longtime observer of the team I grew up loving, which led to my writing, “The Maple Leafs of My Youth: what being a Leaf fan means to me”. Early on, readers seemed to “get” the kind of dialogue I was looking for and picked up on the overall tone of this site. And I thank everyone who has contributed over the years. On the one hand it seems way too early to make many, if any definitive statements about the Leafs. We’re still in the midst of the exhibition season. That said, the regular season begins next week. Roster decisions are being made already. Guys are fighting for jobs. It’s almost always an interesting time of the year. Interesting to hear that Kadri was shopped over the summer (if that’s true). I have written here in the past that I was convinced management tried to move him a couple of years ago, but I sensed they had moved past that line of thought. The brass seems to have a love-hate relationship with the young center. They surely see how cagey a player he is, his vision, etc. But they must feel something is missing. At 24 (in early October), he is maturing into a go-to offensive player. What’s the next step for him? I wonder if I’m pinning hopes too much on a young defenseman (Rielly) and a veteran (Robidas) who has been hurt a lot recently? I see Rielly’s upside as very high, but it’s a lot to ask him to be a difference-maker as a 20 year-old. As for Robidas, I like his pedigree, but he’ll have to be on the ice to have an impact. There are still questions along our blue line. Reimer looked good in his first exhibition start, but struggled early on his his second start. To his credit, like the "old" Reimer, he played much better as the game wore on. Bernier is the guy in net, but the Leafs need two goalies this playing season with confidence. The more I think about Nylander, the more I’d prefer he get a year of high-level development before we start thinking he has to be a top line guy with the Leafs. We all like his skills and hands. But I’d rather he be absolutely ready before he takes that step. I’d rather not see him bounce up and down to the Marlies. Once he’s here, I want him to stay. Komarov is not a savior, but I do think he will help the Leafs re-establish an edgier, hard-to-play-against style. I have precious little to base this on, but I choose to believe Clarkson will have a bounce-back season (though the injury he sustained against the Sabres now clouds the picture). Not necessarily in terms of points, though I do think he will contribute offensively, but overall. It’s his second year here. Playing in Toronto is oh-so-different from playing in New Jersey. I know there is concern about where he will “fit” in terms of linemates, but let’s let this play out. I’m interested to see what, if any, role that Peter Holland has. At 23 he is still young, but this is his time to step up and show that he deserves ice time. As we work our way through training camp, I still wonder if there could be a roster surprise. Leivo? Can Lupul still be the Lupul we have all loved at various points in his Leaf tenure? I know there is not a lot of support for the coach going into a new season, and there are valid reasons (roster deployment, relationship with his players, etc.) for this. That said, I want to see the players accept responsibility, too. They need to be “accountable”. Yes, it is the coach’s job to put players in a position to succeed. But there is also an onus on players to do their job. Maybe the new assistant coaches will bridge whatever gap seems to exist between Carlyle and the team, but regardless, I expect more from the players as well. There’s more we could bat around, but for today, this is s start. Congratulations on your 5-year anniversary Michael! This is a beautiful space where everyone's opinion is respected and, though very accepting and openminded, you exude the authority and confidence that is necessary to keep this forum open to opinions, such as mine, that are not welcome at many other sites in the leafs bloggosphere where the latest fad (analytics these days) is the only opinion that can be expressed. I've learned a lot here about the history of our club and about engaging respectfully with others, The personalities of the frequent posters are coming alive and the diversity of the ways in which different people see the game is a breath of fresh air that I love breathing. I love your podcasts also and am looking forward to being a part of the new season of helping you create more Leaf memories. Thank you very much for making my fan experience better. Thank you very much, leafdreamer. You've added a great deal to the discussion here. I know there are many other Leaf sites out there, but if this is one that people can visit and feel comfortable expressing their views, that's great. We all see the same the Leaf picture a bit differently, and in the right atmosphere, that makes for good discussion. Leafdreamer has done a wonderful job summing up our experience in your playground, Michael, and I would only add that you have provided me with some interesting opportunities to both, contribute to (and receive from) you and your site some very enjoyable (and healing) experiences. You have done a wonderful job creating a 'home' and setting the tone for a 'place' I always like to visit. Thank you for carrying on (and learning it didn't have to be a DAILY burden), I'm happy to 'check in' for periodical posts and trust that is far more manageable now. To address a few of your points, I am excited about Nylander's skill level and am all but convinced that for his development (and our long-term best interests), he should spend another year in Sweden. I think he will 'fill out' over another year and gain experience while not burning the first year on his contract. He will be playing against men, so not a lot of difference from the AHL, where he could play after the Swedish league ends early. It could be a bit like Morgan Rielly having that transitional post-injury year that ended in the AHL for a good stretch, Nylander isn't coming back from an injury (and I'd like it to stay that way), but I think he needs another year to grow, and we'll all be able to delay gratification for some added benefit (while not having him right under our noses, tempting our hopefulness), not to mention, he can sign a contract at higher than AHL pay-grades while in Sweden. Seems like a win-win with his dad overseeing his development, too. Leivo and Carrick have certainly caught my attention, with the former having a solid chance to crack the lineup (at least in the short term, while Clarkson finds out how 'cracked' he may be). The latter may be doing just enough to be the first call-up in a lower line role or even inspire trade talks by the deadline so that some short term contracts may well find themselves dealt for draft picks without hurting the team (even if they're in the playoff hunt) with a Carrick call-up to replace such trade fodder. Holland hasn't done as much as I would have liked, but he's in the conversation and I'm hoping to see him 'up his game' tonight and beyond. One player that seems destined for the Marlies is Petri Kontiola. I actually thought his highlights stood him in good stead for an opportunity, but he needs time with Barb Underhill and to adjust to the speed required in the smaller rinks. He reminds me of another (2005) signing with great vision and skill, but lacking in speed... Jason Allison. The problem is, he was too slow for 2005 and nearly a decade of 'accelerating' play has intervened. Hope he can find that speed, but for now he seems destined for the A... at least he still makes a full salary after paying a half million to leave the KHL (gotta' respect that kind of commitment and wish him all the best). I'm watching all the other story lines that you mentioned, but will leave it at the foregoing for now! One of the fun things about training camp is if/when a new player somehow manages to crack the lineup. It sounds as though a couple of the kids may be on the 'watch list', so we'll see. Thank you for the good words, InTimeFor62. You are a valued contributor here. all the best to the 5th anniversary of your wonferful site! It is a very unique place where our thoughts are valued. Thank you very much! 1. Either Kadri nor anyone else was shoped this summer. If that would have been the case, the team would look very diffrent. The next step for him is playing consistantly for 60 minutes in 82 games plus playoffs. 2. Rielly will be a diffrence maker in the next few years. I like Robidas very much but we have to see how well he plays know after the injury. 4. He is not ready know and playing in Sweden may suit him best. He needs at least one if not two more years. The Lefas must make a habbit of introducing players to the NHL that are absolutely ready. 5. Oh yes he will!!! And so will Winnik and Polak. 6. I don't know about Clarkson. We will see. He again has injury problems. I really don't know what to say about him know. 7. He has a place on this Team and he will do fine. 8. Every year Carlyle has some roster suprises for us in Training camp. Leivo should get one more year with the Marlies but it is good to know that he can step in if needed. 9. Yes he can ! 10. Players have to be accountable and we need to see that. But there are some players new in town that can provide exactly this kind of leadership. P.S. : This is the site I feel comfortable expressing my views! Thank you, Marcus. The time has gone quickly! We do need guys like Komarov, Winnik and Polak- players who will play with an edge. We need- and have- skill, and goaltending. If we can find the right system of play- and the players do their part, the Leafs just may make things interesting. Very glad you found the site, LeafsFan in Mexico, and look forward to connecting more throughout the season. Wow, five years, that’s a great accomplishment! VLM is, for me, required reading. Without VLM there would be something significant missing in following the Leafs. I also enjoy your podcasts and videocasts with MLHS. I hope you are able to continue with those mediums as well, Michael. Like everyone, I enjoy the intrigue around who will out contested roster spots. Then again, I don’t put much stock in the opening night roster. In my experience the bottom roster positions change during the initial weeks once the reality of the NHL grind sets in. Players who experience a hot camp often get demoted and replaced by another player on the farm who might start slow, then build momentum in the AHL. The surprise keepers are rare, and then we seem to hover like vultures waiting for them to fail, even when they don’t fail, like Morgan Reilly, for example. All said though, its hard not get excited this time of year as anticipation builds and the sky seems the limit. And every now and again, a young star emerges, sometimes not the one we necessarily expect to either. My uneducated bets, based on anecdotal evidence, would be Josh Leivo this year, or maybe Percy or Granberg. The Swedish kid looks too green for my liking. But, then again, I am always one for extra seasoning. I'm in full agreement about opening night rosters. (It's often the same in baseball and football- the initial roster changes so much throughout the course of the season beyond the core guys...) But yes, it's fun when we see kids emerge who may surprise and land -and keep- a role with the big club. You know how much I have appreciated your input here over the years, Bobby C.- so it's great to hear from you. I know you haven't been able to post a lot in recent times, but I hope you can on occasion this season. Thanks for your continued support. You made a lot of great points today, congratulations on five years. There is no other site that I am interested in commenting on. Looking forward to your take on the regular season. Good of you to chime in, as always, with words of support, Jim. Thank you. There'll be plenty to bat around as the season gets underway. So many questions still as we near the start of the season. Nice to see the youngsters stepping up. I thought Holland was better tonight as well. 3) Orr out there-- he's played four games, on the ice for 3:12 minutes, 4+ minutes for the rest of the 4th line tonight. What happened to the "playing four lines" plan? 4) Clarkson--how bad is the injury? It won't help his popularity with Carlyle, but from a few different stories I've read, his team-mates appreciate him in the room, find him thoughtful, considerate, generous with his time and know whose side he's on. Respectful as he is towards Randy, Clarkson made the choice, wise or not, to put his team-mates first. He can't be something he never was as a player but he may still be capable of contributing more than we know. 5) Phaneuf--I've also heard that the whole team loves Kessel, but are not too happy with Phaneuf. All hearsay but it makes sense to me. It was suggested that the team knew Randy's systems wouldn't work, were frustrated with the whole confusing and futile mess and wanted Phaneuf, as their leader, to say something. Lupul tactfully suggested there was a problem at the end of the season. I think Dion, much as I appreciate him for his efforts and stuck up for him as a player, must decide whether he's Randy's guy or the captain of the Maple Leafs. He can't be both. I hear you on all counts, Colleen. On your last point, being a team captain can be awfully difficult. Usually you are the "organization's" choice to lead the team (unless your teammates voted for you). Dion was management's choice. So who knows how conflicted he may feel. I don't doubt his work ethic, though. Thanks for the kind words, too. I'm glad you've been on board for the past year! Reimer in particular receives a lot of extra bumps out there, we've seen it already this pre-season-- insults that teams know they can get away with it. There's never a response. Having enforcers who stage a fight with another 4th liner doesn't address the problem. Mark Fraser, for all his faults, never let anyone mess with his team-mates. Ashton has shown this quality. Clarkson has taken on the role but he can't do it all himself. We saw a lot of what I can only describe as tentative play last season, a complete switch from what we saw in 12/13. I wonder how big a difference we would see if every player on the Leafs knew someone had his back. I am beginning to understand all the talk about "lack of character" this off-season. I don't know if it's Randy--only enforcers may engage (?) -- but the character of this team has been stifled. All these things are connected, it seems, Colleen- leadership, veteran experience, and a team identity that has been sorely lacking for most of the past decade. I thought we started to build a bit of an identity in the lockout-shortened season, but less so last year. 2) You know how high I am on this guy. I studied his international games after we signed and he is really good. But he has problems with the kind of speed that is needed in the NHL. As alot of guys in the press complained during the Olympics,the game on the bigger ice is a lot diffrent. The NhL, since the 05 lockout, created a game that is mainly based on speed and on the small ice a special kind of speed is needed. He needs a bit time to adjust. He is waiver exampt perhaps a few games in the AHL will help. I don't know what they do with him but I hope they won't let him down and give him a chance. But only through the screen it is very difficult to see how wide the gap is. What makes him struggle? If I could see him in practice it would be easier to say. I hope he stays and gets a chance. On the other Hand Booth wasn't great either. 5) To whom did Lupul say there was a problem? To Carlyle, Dion or the press? Something is very intresting , I often hear from reporters that Phaneuf is a problem in the room. They do not explain themselves why. But I would like to know what they mean. Perhaps there is and perhaps not but I find it intriguing. A captain is the link between the team and the coach, he can not sepperate from either. He needs to get the trust of his team mates and can not loose the touch to the coach. Highwire act. Michael, I said it in last weeks article and here we are already having problems on D.
Talinder as an option is gone, Franson may be out for longer. Can Holzer and Granberg/Percy carry the load? How much time will Robidas need to be back on his top level? Hi Marcus- sometimes kids will surprise us and look like they belong right away. I'm not sure that Granberg or Percy will do that, but they both have the ability to play at this level, I think. Michael, a hearty congratulations on five years! I have been here a few years myself and it has always been my favourite place to not only read about the Leafs, but to share my own views with you and so many other thoughtful fans in what has become a tight-knit cyber-community. I too have always enjoyed the discussion that takes us back to the past, if anything I am a bit jealous that my own memory does not go back as far as yours or others. I was not here "In time for '62", but just in time for 1980 and I certainly missed out on a lot of great history there! Here's to another great season of hopes and dreams, and on to the next five years with your forum! I appreciate your sentiments very much Pete, and thank you for your outstanding contributions here. Seems like you missed most of the Ballard years and would have been in your 'fandom prime' in time for 93, which must have been exciting to experience at a younger age... for me, it saved my Leafdom, as I was no longer hopeful about the Leafs... And then came Gilmour! But, there was some great excitement through the 70's (when Sittler, MacDonald, Salming and Palmateer were such a joy to watch). Always enjoy your comments, Pete. Congratulations Michael. I believe its been 3 or 4 years for me reading your site. In terms of roster surprises I agree that Leivo may be one. Perhaps Brandon Kozun as a 4th line energy/penalty killer? I also think that Percy is getting stronger and more comfortable as the pre-season progresses. Thanks, apollo678. Good to hear from you. You mention Kozun as an energy guy. I like the idea of having an energy line- something I talked about here a fair bit at the end of last season. I think we have the players who could fill that kind of role. Thanks Pep- it's great that you discovered the site and have been able to be part of the conversations here. michael, congrats on five years... i've enjoyed ever since i discovered your blog 3 or so years ago. great stuff... great conversation... i always leave with a warm-fuzzy-feeling (which is refreshing considering our team isn't exactly giving us a tremendous amount to cheer about!). I always look forward to your posts here- thanks Alex! Michael, I was wondering if we could do a discussion on Carlyle comparing him to coaches recent past (thinking of Quin mostly). I'll reflect on that, Leafs Fan in Mexico. I am back again and ready for a new year of Leafs hockey and especially VLM and the many insightful contributors! Congratulations on your 5th anniversary. I haven't seen much of the preseason but I don't put much stock in that anyway. At this point, I think we are still tied for first place. Let the games begin and let's see what we get. I hope it's an enjoyable ride this year. Great to re-connect here, Ed. I'm sure well talk about twenty games in.